CW Group is pleased to announce the publication of the new issue of CemWeek Magazine. The 32nd issue provides a detailed analysis of the global oil well cement market from the CW Research team and a five year forecast of the sector. 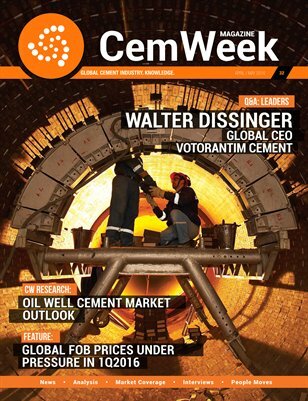 CemWeek’s latest issue also features an interview with Mr. Walter Dissinger, Global CEO of Votorantim. Mr. Dissinger agreed to speak about the challenges and opportunities that the company faces, about current issues and future solutions. This issue provides a features on the Global Cement Trade Price Report (GCTPR). The decline in global sales, coupled with overcapacity in some exporting markets, will pressure exporters to find other markets. The 32nd issue issue also includes insights on the 7th edition of AshTrade, that brought together industry specialists from more than 20 countries for a discussion on the key burning topics shaping the combustion by products sector.